'Ono Organic & Fair Trade Teas Are Here! 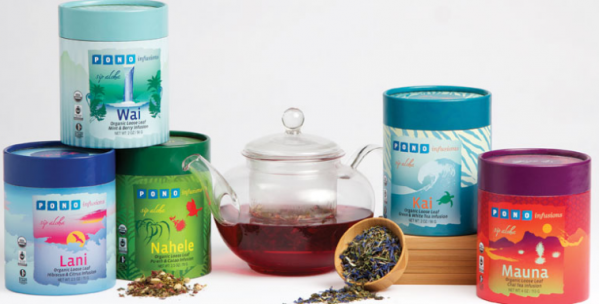 We are proud to announce that PONOinfusions teas are now for sale here on Maui. We have received wonderful feedback about our teas from customers so far! Please visit our website's "Find A Retailer" page to locate stores that carry PONOinfusions products. Are you interested in carrying PONO products? Our PONOinfusions Ahupua'a Line of infusions is the perfect niche product for boutiques, hotels, spas, and restaurants, either in Hawai'i or beyond. Please contact us at: info@PONOinfusions.com or call us at 1-855-PONO-808 (1-855-766-6808). We will be happy to provide you with our brochure and assist you with a PONOinfusions' product selection that is customized for you. Please stay in touch for our many other happenings this Fall, including the launch of our online shopping cart for you to conveniently and securely purchase PONOinfusions on our website, wherever you may be! Aloha kākou! PONOinfusions has launched an Indiegogo crowdfunding campaign from early April until June 2, 2013! Click Here to visit our Indiegogo Campaign Page and to watch our Video. PONOinfusions’ products connect you to Hawai’i’s precious natural resources and threatened and endangered species, as well as provide an outlet through which those who love tea and Hawai’i can give back. Through your purchase of PONOinfusions’ certified organic and fair trade infusions, you help us do what is pono by supporting Hawai’i based organizations involved in conservation, reforestation, and invasive species management efforts. There is still more that we need to accomplish before our PONOinfusions products become available for purchase in stores and via our website. We ask that YOU—our friends, family, and Indiegogo community—help us achieve our fundraising goals to help purchase and create our first batch of products! With your support of our Indiegogo campaign, our PONOinfusions products will be in your hands 6 months after our fundraising goal is reached. If we reach our minimum $10,000 fundraising goal, we will be able to offer our ’ono PONOinfusions products in select Hawai’i stores. If you help us meet our stretch goal of $20,000, we will be able to offer our PONOinfusions products in Hawai’i and in select stores in parts of the West Coast and the Pacific Northwest! We would like to express our most sincere gratitude to those who have helped us so much already. We look forward to providing you with healthy, certified organic infusions and carrying forth our mission to do what is pono! We ask that you please help support our cause in any way you can. Mahalo nui loa (thank you very much) for your kōkua (help), and for your support!